5 questions to ask BEFORE hiring a wedding photographer! As you make plans for your big day, there's a few big decisions, like, where do you want your venue to be? Who will cater? And eventually, who's going to take the photos? You're already stressed out! So many things could go wrong on your big day! DON'T let the photographer be one of them! Because I'm a nice guy I won't scare you too much with all the horror stories I've heard over the years: "I shot the entire wedding without a film roll / SD/CF card" to "My hardrive died and I lost all the footage" and even "because I only charged $500, I can't give you any digital files, you have to buy prints for $250 each!" The worst one: "Oh I thought your wedding was today, I forgot! No I can't make it I double booked." all the while they never even return the deposit. These are horror stories that I wouldn't wish even on my worst enemies! Here's how you can avoid them all! Most photographers have some sort of portfolio or lookbook to show. If they don't: stay far away. Maybe they could be a second shooter. But whatever you're looking at is roughly what you'll get. Sometimes it's better, sometimes it's a little worse. What you're looking for is consistency, can they do it again? Ask to see an album. An album will show you how many good photos came out of the day! And you'll get a good idea of how many you'll get when all is said and done that are any good. Pricing can be rough, the old saying is true though: You get what you pay for! Most wedding photographers that charge anything less than $500, I would be surprised to get 3 good photos. Ask to see the contract. Be prepared for a realistic number, anywhere between $1200-$3000 for a wedding photographer is not only appropriate, but recommended. But make sure there's no hidden fees or small print. Ask them exactly what you'll receive and how you'll receive it. Don't forget to talk about travel/ prints/ post processing/ second shooter/ assistant/ photoboot / turnaround. Ask if they will be at the rehearsal! When practicing, and making decisions about placement, sometimes it can really help to have a photographer there and tell you what might look best. Maybe this is even before the rehearsal, I call this session a Pre-Vis so I can make critical decisions and adapt in the best way. Having a personal relationship with your photographer is important. When the big day comes, you want to know, trust, and understand that the photographer is going to perform well and keep you calm and collected. It's just natural for me to be totally chill while everyone else is freaking out, I kind of laugh to myself actually. It's very common and even though I'm invested in my clients, I have a larger perspective and can lower stress just by having a level head. This question you ask your gut. It's basically a gut-check to make sure they're right for you. But usually having lunch with the person is a great way to see if they're going to help you, not make your life more stressful. In my home town, Nashville TN? Thanks for reading! If you made it this far in the post good job! You've done your research! If you want the best deal possible go here. Evelyn Rose and I had a pretty fantastic photoshoot! It's cool to make new friends on this crazy journy! Learning about photography, I follow only a few people. Way less than I should, the number could be counted on only one hand. At the top of that list is Jeremy Cowart. Recently, flying back home from California, I met Jeremy Cowart at the airport terminal. We shared the same flight to Nashville, I was going home, and although Nashville is also his hometown, too, it was just a layover for him because his destination was Israel. We only got to speak for a brief moment, I could tell that he was busy and working hard on his laptop for his latest project I'm sure. But when I approached him he greeted me with his iconic laid back warm feel. Didn't blow me off to continue his work, and had the appearance that what I was saying just so happened to be the most interesting thing he had heard all day. This is the attitude I can only daydream of attaining. I'll be working on this for myself but in the meantime, here's one of the most inspirational teachings he has ever taught. Despite his new viral video on his splash page on his website, which you can view here: jeremycowart.com. This logo is for Wattsav.tv, this took me a few hours, but I'm very happy with the results! If you ever find yourself doodling or sketching something out, and by mistake you find that you really like the little doodle you did. Maybe it can be converted into a vector logo so you can use it for your business. 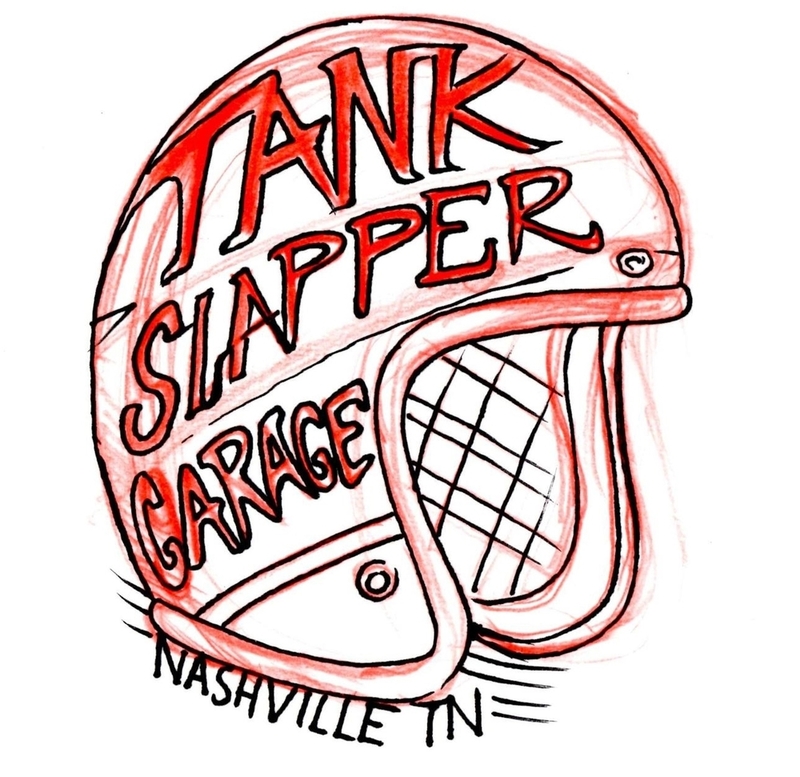 Norm Allen, the owner of Tank Slapper Garage did just that. Honestly, I've never done this before. I have worked in Illustrator as a kid thanks to my Dad, Travis Foster, an illustrator Rep and Former Illustrator. But nothing to this extent. So here's the sketch he sent me, and the results. Enjoy. I'm writing this article when yet again I hit a wall when communicating with clients due to pricing. Yes, I am the most affordable option local to your area for the greatest quality. When I go to a restaurant, I often ask: "What's the most bang for your buck?" It's a simple question, I want to know which of the $20.00 plates will weigh the most and provide the greatest amount of calories and last the longest before I get hungry again in 2 hours. Well, if I want more food, I need to pay more money. I'm guilty of being disappointing because I could go and spend $20.00 at a local supermarket and fill myself up for an entire day. I get it, people are disappointed when the appropriate budget for a video or photo shoot is in the thousands when they are looking to spend in the hundreds. "Well I could rent a camera and do it myself and save some money". Yes, that's true, but then you'll get amature work. It's funny. People go to both extremes: "How much do you think they spent on that avengers movie?" - Probably 2-3 billion dollars, that's why I'll spend 12.00 to see it in the theater. How much do they claim to have spent? 220million. Wow... Now how much to make a promotional video for your event? I guarantee 50-100 dollars is the wrong answer. I see your logic, I hear you loud and clear. "The event is only 5 hours, that's 10-20 dollars an hour" Well, events actually call for more cameras than a studio production. More backups and safeguards to capture the moment, ect. What is a fare rate? 2-4 thousand. What the majority of clients expect? Why? Let's say you have a budget of 50k dollars. Allocate enough of that budget to accommodate the costs of recording it. If you run out, and only have 1 thousand for shooting and editing an entire day's worth of work, with multiple cameras, you're shooting yourself in the foot. The best bang for your buck is to spend more so that it ensures the quality you need. If you have a budget for an event, and you have 50k to spend, you have to decide if you really want it to be captured. Because anything below 1k dollars is going to do the opposite effect, it's going to hurt, not help, you. It's the same as not eating all day and then going into McDonalds and asking for a single fry. You're going to be extra hungry because you've smelt and tasted food and yet you don't have enough money to satisfy your hunger. 1-2 thousand for a small production in an controlled environment with the ability to say "Try again". 20k-250k for commercial. This video needs to sell your product or service. It needs to be well done and professional otherwise it will hurt your business and growth. An amature video will have the opposite effect of a well-done video. Here is a nice video explaining the cold, hard, truth about speculation work (Spec Work). If no other business will serve you on the idea that you will not have to pay for their product or service after the fact, then don't expect others to! So you're looking for a photographer, and you're trying to figure out where to find one! 1) You Get What You See! Portfolio is everything! Do you like what they have done so far? I put this image in here so all the words wouldn't scare you. I know this runs off of the "buyer beware" campaign more than anything, but here's what you need to ask. "Did you take these shots with the equipment you'll be shooting with?" "Did you have any help or did you take these shots by yourself?" 3) Where to Find a Photographer? Word of mouth is the BEST way to find a photographer, however, just reference step 1 and make sure they have a good portfolio. There are other methods out there, like Adobe's Behance, upwork (formerly oDesk) and a less commonly known site, needto.com. The honest truth is, if you really want a good photography experience, overcompensate with your pocketbook. People will refute what I'm saying, but I've seen it over and over again. Higher budgets honestly result in higher quality images and customer service. Smiles all around! This is where the rubber hits the road. The big mystery that scares everyone away because they don't know how much a photographer is worth. Let me make it simple. It's all about usage. Commercial/Business: 5-20 skews for a business, because these photos will make the business A LOT OF MONEY, is worth 30k-70k dollars. This might only take the photographer a week or two. But because we know how much revenue is generated, we want to give you the best mind-blowing photos as possible, and get compensated for our work. Wedding photographers don't get 165 days to work, but only 52 weekends. Divide the average salary of a professional photographer by 52 and you, as the client, need to cough up at least 769.00 before tax. But that's only if you want them to make 40k a year. A lot of photographers rent equipment, and that usually costs 3-4 hundred dollars. And then most photographers need a second shooter or assistant, (and if they don't have a second pair of hands... well... good luck.) And that usually costs 2-3 hundred. There's a reason competitive price points for wedding photography is $1200.00-$2000.00 But here's the catch. No one wants their weddings in the dead of winter or mid-summer. So the weekends a photographer actually get to shoot are cut in half... Don't be fooled, they don't make 2k in 2 days. Trust me, if they're lucky they can pull the 769.00 a week on average. The editing process is mundane, and time consuming. Here's a trick though, with any photographer, if you pay them a portion up front, then that validates you as a client immediately, and also gives them the cash cushion to buy or rent better gear so that you get better photos! It really is in your interest to front some cash. In addition, most photographers (not all) but most, are strapped for cash. I know, you never would have guessed, how can someone who charges 75-125/hr on a regular be broke? My bank statements speak for themselves. Just know, that if you front a portion of the cash, the photographer feels more obligated to provide better work, sad, you think we would give the same A+ experience and effort to every customer, but it just doesn't happen. Last, but not least, there is a huge burden that is lifted off of a photographer's shoulders when he has that cash-cushion to work with for the shoot. Event Photography: Finally! Here's when you can get a break when it comes to pricing. You can finally actually understand how much you're paying for your photographer. It's essentially just an hourly rate. MAKE SURE know how much the end price will be after all is said and done. Make sure they know you only want to be charged for the 2-3 hours. At this time I personally charge less than I would recommend at 75/h (with a 2 hour minimum). You have to understand, if you're a business that will be using these images for promoting your business, you can't expect such a low price. This is the "Come photograph my birthday party" or "Housewarming party". Most of the time, with these hourly price points, we will charge extra for travel time. And remember, for every hour of photos, the editing process can be 2-5 hours. That's right! That 75/hr just turned into 12.50 an hour. Being a nice person can go a LONG way, because on the second full day of editing, we start to not really care so much about those little things we were fixing if we don't really care about you. This is almost subconscious. Have you ever written a book? Or paper? Just like the several stages and several drafts of a paper, there are also several drafts of the editing process. I'll often go back with a fresh set of eyes to make sure I didn't miss anything. So I could have you those photos by tomorrow if you really wanted a rough draft, or you could wait a week and get flawless edits. The same thing goes with on-sight processes, too. Light setup, location scouting, everything. If you're able to hold still for just a few more seconds, we might be able to adjust a few settings and get the shot that works! Pro photographers can see a scene, light setup, camera settings, poses, and post processing before their eye even glances through the viewfinder. With new photographers, you're going to spend twice the time before they even really start taking photos for real, and now you're already tired because you thought they were snapping away at your beautiful smile when they were actually just adjusting their settings. 7) Will you Enjoy the Photographer's Company? If you're able to call up a previous client to ask them how they did with the photographer, or if they felt comfortable, or something to find a way to gauge if you and the photographer will click. Photography is chemistry. Even if you're a business owner looking to get photos, if you don't feel comfortable around the photographer then you might not be able to communicate well. If you're able to communicate what you want, or get a sneak peek at the shots before they go into post and genuinely work with the photographer to communicate what you want in a way that doesn't make the photographer confused or angry or uptight, this two-way street of relaxed, comfortable, work-relationship will result in better photos. This is especially important if you're getting photos taken, let's say, maternity shots, and the photographer is an old fart trying to lighten the mood by telling bad jokes, or being too flirtatious, and all you can think is "I'm paying this old fat guy to take photos of my naked self and I don't feel comfortable at all." Then it's probably too late! That's why you want to really vet your photographer, not everyone works well together, and it's important that you're comfortable while getting your shots taken, and that the photographer is comfortable. It's very much a too way street. And yes, the photos will reflect your thoughts and awkwardness if you're not careful. I know these titles seem straight out of a self-help manual, but I'll try to be as specific with what I'm talking about here. Rarely is it ok for you to beat around the bush trying to get at an answer without directly asking it. Just like when going to a hairstylist, if you bring a picture and say "Can I get something like this?" The obvious answer is "Yes, sit down, let's get started." But if you ask: "Do I have the bone structure for a hair style like this? And can you really get my hair to look this way?" They'll give you a more honest answer. The same way with photographers (and don't forget the example picture, that's important). Having a clear example of what you want done, and going over the example photos thoroughly will help. The "I really like this one..... and this one... and I don't like this one" Doesn't help the photographer at all. But "This photo looks good, but I have a double chin, the building looks like it's about to fall over, and I'd like to try again with a better pose" would help both of you out. And in reality, I often work with my models in a much similar fashion, I'd take a few photos, I'd show them the photos, they would gag and cry and then we'd shoot again after they composed themselves better. This way I don't have to say "You look really ugly because you don't know how to squinch, or smile." If your photographer isn't working with you on this level, try and initiate this type of trust and interaction. It will be better for both of you. After reading some other articles online, I was kind of disturbed with the amount of false-information and advertising, and even things to ask your photographer. One article stated that you should probe your photographer with technical questions and quiz them on certain aspects of photography. First of all, this will only create amnesty between you and the photographer, second, do you really know the answers to the questions that you're asking? If not, that's just time wasted. Anyone can fake a confident and smart-sounding answer if they know you don't know the answer yourself. And third, a lot of the example questions were arbitrary, photography is an art, it's about emotion and feeling. There are plenty of photographers that can explain every light law, and build a camera from inside out, but won't be able to deliver an amazing photography experience. Jeremy Cowart, one of the few photographers that I look up to and admire, admitted in one of his Kelby Training tutorials that he was struggling with light-metering and he found out from an assistant that there's an in-camera light meter. I'll never forget how he was still able to get amazing images even without using a light meter, at the same time, I'll go into Dury's, a high-end photography store, and the behind the counter hourly-paid photographers know EVERYTHING there is to know about photography, yet can't produce the emotion behind the images like someone who had never gone to school for it can. I say this with reluctance because I tend to fall on the technical side of the spectrum, I'll know, in theory, how an image was capture, yet not be able to go out and do it! Many say that I am naturally gifted, however, I constantly see my flaws and try to learn from them as I go, yet I see other people younger than me take much better images that, like Jeremy Cowart, have no idea, really, how to use a camera. Besides point and shoot. And there's something magical about that, because they don't focus on technicality, they focus on the emotion and subject. Something that a lot of photographers will never know. 10) Other Photographers are a Resource! Are you thinking about hiring a photographer? Truth is, the professional photography circles are smaller than you think. There's a lot of amateurs that are around, but open shoots, models, jobs, I've run into people I've interned with on job locations and worked side by side. We really do know each other, and so if you ask us, more often than not we can give you our honest feedback. In Nashville TN, we typically don't like to diss each other, you'll find that more in NY or LA, but we like to keep it lighthearted, but if you ask for an honest opinion and recommendation, budget, and other shenanigans, we know the field pretty well, and can more than likely just shoot you a quick response. Don't go too deep, we're pretty busy people and usually have multiple projects at hand, and you have to ask right otherwise we'll think you're crazy for not asking us directly, we are pretty narcissistic. But usually we each have our own niche, and don't mind. For example, although I would like to do fast cars, honestly, I do much better with motorcycles. Hello, my name is Jeremiah Meriwether. I am the Founder and Director of SimplyGO, an Evangelistic Ministry based in Jacksonville, Florida. Michael was a fantastic help in creating a Website for the Ministry. He knows very well what to place on the Website, how to put together a professional looking Website, and he accomplishes his work in a prompt manner. I would highly recommend him to anyone who would like a high functioning Website! Michael is an amazing photographer!! He did my prom pictures for me and I was extremely happy with them. Definitely recommend him! Michael is a wonderful photographer and great to work with! He took my prom pictures and I really loved them. Definitely recommend him!! Michael has been instrumental designing and composing my website. My AV business has taken off since it went public. Thank you for your insight and perseverance seeing my vision through. Awesome photographer. Local guy that was always willing to meet with me and work with my schedule. The photos he took of me look amazing. The way he edits the photos really bring them to life though. He also photographed my cabin in the smokey mountains, which looks amazing! Michael Foster is a fantastic photographer & he's really easy to work with. I've known and worked with many photographers over the years both in the music industry and for web productions and Michael is top notch. There really isn't anyone that I'd prefer to hire in Nashville. Michael is an incredible photographer, videographer, artist and an even better person. I've worked with him on several music videos and photo shoots, and I've always been extremely satisfied with the projects and the overall experience. He is fun, easy-going and easy to work with. I highly recommend him to anyone looking for a professional product at an affordable price. I needed some fashion shots done in a pinch and Micheal was able to get to me and finish the photos with record turn around time. Easy to work with, very creative and produces quality work. I would recommend Nashville Puma and Michael to get your visuals taken care of any day! Michael seems to be a jack of all trades! I have worked with him specifically on image toning and editing and he's consistently provided quality results, consistent with my editing standards. On top of that, he's been responsive, turns work around fast, and all at very competitive prices. If you are a photographer looking for toning and retouching work, or a business looking for creative illustration and branding work (including photography! ), I would highly recommend contacting Nashville Puma. Michael will definitely take care of you! Nashville is a great place for Photographers for many reasons. If you follow my work, and poke around, you'll find out why. If you're looking for a photographer, the most important thing to know is how to read someone's portfolio. Check out my 10 things to know before hiring a photographer.